Lonnie Wheatley, BIXBY, Okla. (July 26, 2018) – Cannon McIntosh and RL Hudson/Toyota-TRD No. 08 Midget team are back in POWRi West Midget League action this weekend as they take to Oklahoma City’s 1/5-mile I-44 Riverside Speedway on Saturday night. It will mark the 15-year-old’s fifth outing of the year atop the I-44 Riverside Speedway clay oval. McIntosh has picked off a pair of heat race wins in POWRi Midget action at I-44 this year and rallied from the 19th starting position to capture a fourth place feature finish on April 28. Mixing in some Sprint Car starts along with the Midget slate, McIntosh currently sits fifth in POWRi West Midget League points despite missing several events. Overall, McIntosh has posted three top-five finishes in POWRi West action among his handful of top-tens with a third-place podium finish in tandem with the POWRi National series at Grain Valley, Missouri’s Valley Speedway on May 4 the best of the season. 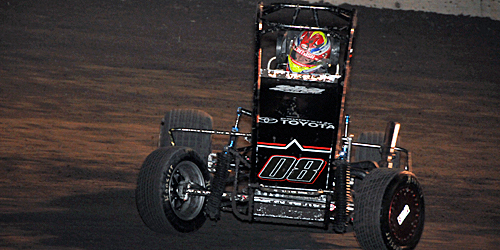 McIntosh’s most recent action took place at Valley Speedway on July 13-14 where the young gun opened the weekend by earning the pole position for the feature by virtue of a charge from eighth to first in heat race competition and then rounded out the weekend with a solid seventh-place finish in the Saturday night finale. 2018 Quick Stats: 21 races, 4 top-fives, 9 top-tens. Up Next: POWRi West Midget League at Oklahoma City’s I-44 Riverside Speedway on Saturday night.